Everyone’s talking about Tom’s heated party. Jan and Tom flirt in the car park, and she mentions his interview for Clinical Director yet. Owen tells Chrissie off about her appalling behaviour at Tom’s party, and says she should apologise – especially as he might soon be Clinical Director. Chrissie tries to apologise, but Tom won’t listen. Lisa and Danny wake up in bed together. Lisa seems to think that it’s the start of a new relationship, but Danny’s not so sure. Lisa says he needs to break free from Diane, when Diane comes bursting in. She’s clearly upset, and it’s awkward for both of them. An unshaven man greets Tom near the car park, and it’s his brother Martin. Martin needs £20,000 to help with his heroin addiction, but Tom gives him only £100 and tells him to leave. However, Martin overdoses in the grounds and is brought in needing an operation. Tom refuses as it’s against his principles to operate on someone who can’t help themself, and is a heroin addict. He convinces Martin to change his surname, and begs him to recharge himself in at a different hospital. After this ordeal, Tom meets Jan for his interview. He explains about his “zero tolerance” policy, that in which a patient that wont help themself cannot be treated. Ric also makes an impressive speech, declaring that they are doctors and shouldn’t play God. The votes tied, but Jan – clearly taken in by Tom’s charm – goes with Tom, and Jan lets the two men know who has secured the post. Tom invites everyone out for drinks. Tom makes it clear that he expects Chrissie to behave better, but meanwhile she’s constantly flirting with Ed. She cancels Katie’s evening with her and Owen, which annoys Owen and he lets her know that she may not want kids, but she has to be decent to his. 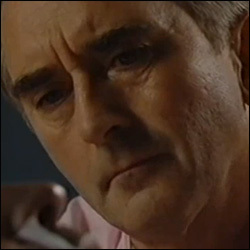 Martin tell Tom that if he doesnt operate on him, then he’ll tell his ward and the hospital his secret – he used to be an alcoholic, even though he’s been dry for ten years. Tom says he can’t, it’s against his new zero tolerance policy, but he eventually agrees. Martin tells Ed that Tom’s an alcoholic, which doesnt come as much as a surprise to Ed, and Tom confesses to Ed that Martin’s his brother. Tom and Ric are at blows, and Diane stands up for Ric. Both disagree on hospital policies. Ric is amused that Tom’s going against his new policy, but after a little research he discovers the truth about Tom’s special patient. He confronts Tom, but says that he won’t say anything. It seems Ric might be too nice for his own sake! Chrissie’s just about to grab Ed for a hot night out, when Owen turns up and says that Katie’s not coming after all and offers to take her home for a quiet nice in. Chrissie looks unhappy by the idea, but roles her eyes – leaving Sandy to jump in at her place with Ed. Sadly, he’s not interested. Danny also turns Lisa down, it seems that Miss Lloyd may still have an effect over him. Ed finds Tom sitting with his brother. Tom says that he’s ashamed about his brother, and tried to help him and feels responsible for his brother’s failing. Ed responds that it’s not his fault, and that he should go out for some celebratory drinks. Tom, however, still looks upset. – Mandy Cummings, admitted to Keller after a car accident. Is brought down to maternity after complications with sterilisation strips that she had inserted against her husband’s wishes. – Ayeesha Taylor, in to have one of her breasts removed. It becomes obvious that she is pregnant and she wishes to have the second breast removed to avoid chemo which could kill the baby. When the second breast is removed, it too is cancerous. – Martin Campbell-Gore/Phillips, admitted after a heroin overdose. Tom doesn’t wish to operate on him but does in the end. Tom: Be gentle with me! Tom: Most of the time I hate him, but you know, looking at him lying here like this I know I failed him. Ed: So why didn’t you just give him the money? Tom: Because I was afraid it might be the last time he ever needed. Guide by Sophs & Karin.